The good news is that there is no need to compromise aesthetics to secure a department’s most vital assets. Proven to substantially reduce the risk of theft or loss due to fire or water damage, Tambour Security Shutters are a great choice. Using as part of disaster recovery plans by tying in the door with the fire alarm system, is another option. 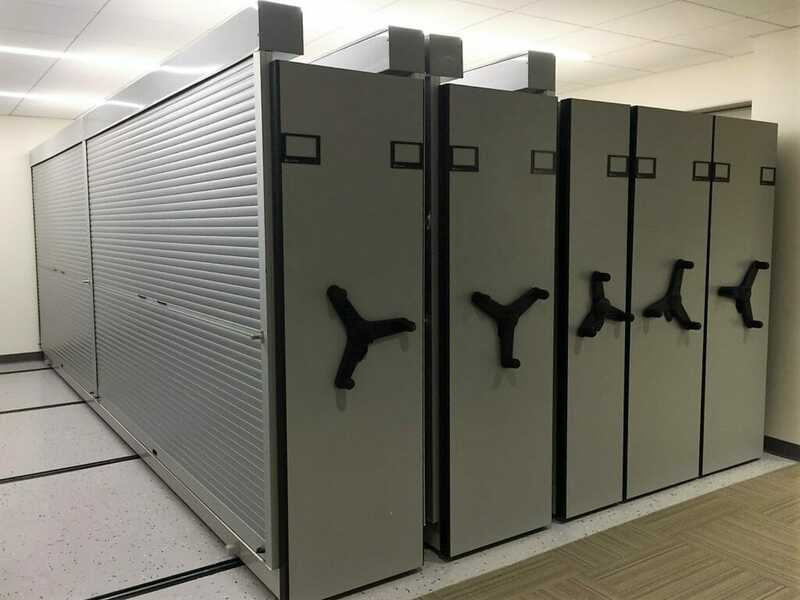 We can provide storage solutions that include the added advantage of security in departments that never realized they needed it. Also, work areas that house tools or other expensive materials can benefit from the added “gated” security of a drop down shutter. Just by installing roll up doors on most existing shelving, high density filing systems and casework furniture to deliver a fully turn key solution, we can provide additional peace of mind. Custom modular millwork can be fitted at time of manufacturing to provide roll down security with rolling tambour shutter doors. Bottom line, speaking to a consultant to see what benefits a specific environment is the best way to see what works for you. Operational options can be as simple as the Counter Balance (manual push up/pull down operation) to Remote control. Other options include electrical motor. Also, another feature is easy operation by using either a rocker or key switch. Also, another option is the remote control or the Crank Rod which clips on or off the shutters in seconds. Compared to more expensive measures, roll down lockable doors are the easiest way to comply with HIPPA requirements and definitely enhance pharmacy security. We can add the roll down security shutters to the pharmacy modular casework furniture we design. Rolling security shutters can be installed on most modular casework furniture. Complimenting the design and not detracting from the general aesthetic is another benefit. Existing or new mailrooms with mail slots that house important documents would benefit from the security of a roll down shutter. You can find the right choice for your business environment with the latest models. Unlike hinged doors, rolling doors do not infringe on aisle space. Secure your important assets. Modern Office Systems looks forward to assisting you in finding the right solution. Call us for a free consultation. We have the solutions to your storage and security questions.